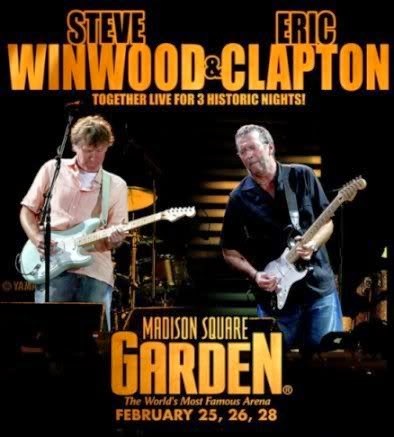 When Eric Clapton and Steve Winwood reunited for a short set at last year’s Crossroads Festival in Chicago, their chemistry sparked in ways that left fans wowed and wanting more. Last week in New York City, they reconvened for their first full-length concerts together since the breakup of Blind Faith in 1969. Closing out a three-night stand at Madison Square Garden on February 28, the two legends thrilled a sold-out audience with plenty of awe-inspiring moments and one colossal setlist. Indeed, this was no routine greatest-hits concert, but a blues-heavy fusion of Blind Faith mixed with selective songs from their respective careers as well as others from peers and influences. Rounding out the band were bassist Willie Weeks, keyboardist Chris Stanton, and drummer Ian Thomas. Setting the tone straight off, Clapton dug into the leaden riff of “Had To Cry Today” as Winwood’s soaring voice took flight. Following a brisk cover of J.J. Cale’s “Low Down,” both men ran roughshod through Clapton’s “Forever Man,” the song sounding far ballsier than its original version. Winwood somberly announced the passing of musician Buddy Miles before a raucous rendition of “Them Changes” was played in his honor. And when Clapton commenced with “Presence Of The Lord,” the celestial energy in the air felt electric. Winwood offered particularly striking performances of Traffic songs, from the rollicking instrumental, “Glad,” which segued into “Well All Right,” to a sparse and mesmerizing rendition of “No Face, No Name, No Number,” drawing a massive ovation from the audience. In back-to-back solo segments, Clapton played an acoustic guitar on “Kind Hearted Woman Blues” before Winwood took to the Hammond organ, arguably giving his finest vocal performance of the night with “Georgia On My Mind.” Clapton (and others, assuredly) has compared Winwood’s voice – as far back as his days with the Spencer Davis Group – to that of a “white” Ray Charles. On this song, he sounded genuinely like Ray Charles. With everyone reassembled on stage, Clapton and Winwood began what would amount to a monstrous, nearly twenty-minute homage to Hendrix. With “Little Wing,” they played with skill and reverence. On “Voodoo Chile,” they plowed through an extended and devastating surge of blues and passion, saturated by Clapton’s fiery solos and Winwood’s ascending vocals until the song – and the concert – reached critical mass. Revisiting their shared past one last time, Clapton and Winwood gave a fantastic performance of “Can’t Find My Way Home,” its ethereal aura brilliant as ever. “Cocaine” then erupted to close out the main set, with Clapton going to work on the wah-wah pedal while the audience danced in the aisles. And in all its psychedelic glory, “Dear Mr. Fantasy” served as the consummate encore, beginning with its trippy groove and climbing toward its frenetic climax and ultimate conclusion. Much like their set at Crossroads, this magnificent concert as well as the entire three-night stand will undoubtedly have fans of Eric Clapton and Steve Winwood clamoring for even more.